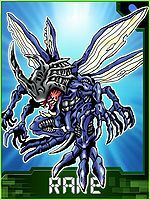 A fairly unique Insect Digimon, even among newly discovered Digimon. The details of how it evolved into an insect Type are unclear, but it has both ant-like power and the flawless defensive ability possessed by a beetle. Its personality is the epitome of an insect's, and because it only possesses the instincts for survival, it has no intelligence or anything similar. 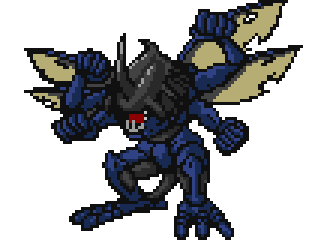 It swoops down on hostile Virus Digimon without mercy. Its head has been metallized, and boasts the defense of an iron wall. Its Special Move is "Mega Blaster". A Digimon which has the appearance of an insect. Part of its head has been metallized, so its defense is nearly that of an iron wall. Its personality is the epitome of an insect's, so there are many times when it lives by its instincts. 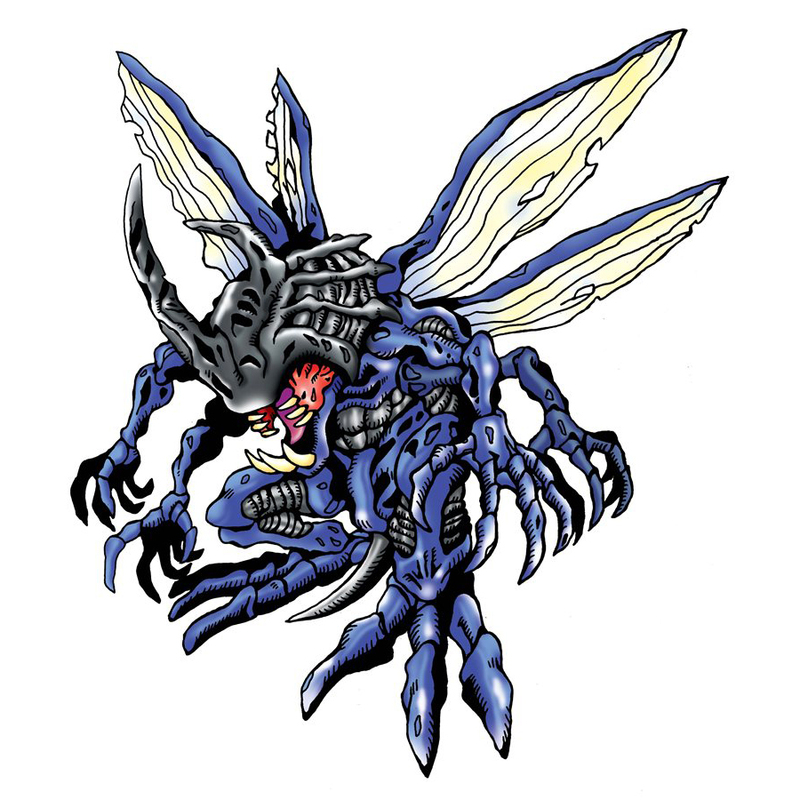 Among newly discovered Digimon, it is a fairly unique Insect Digimon. The details of how it evolved into an Insect-type are unclear, but it has both ant-like power and the flawless defensive ability possessed by a beetle. It swoops down on hostile Virus Digimon without mercy. Its head has been metallized, and boasts the defense of an iron wall. | Kabuteri comes from kabutomushi 「甲虫（カブトムシ）」, which means "rhinoceros beetle". Anime/Manga Digimon Adventure: "Lightning! Kabuterimon"
Mega Blaster  メガブラスター Mega Burasutā Electro Shocker/Mega Blaster Fires a ball of electricity at the enemy. 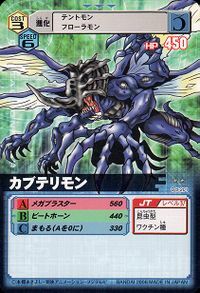 Beet Horn  ビートホーン Bīto Hōn Beetle Horn Attack/Big Horn Impales foe with horn. Blink Thrust  ブリンクスラスト Burinku Surasuto Quick Thrust Sends blades of air at the foe from his horn or claws. Danger Sting  デンジャースティング Denjyā Sutingu Shocking Touch Grabs hold of an enemy to electrocute it. 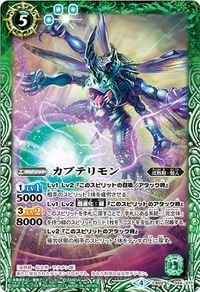 Insect Plague  インセクトプレーグ Insekuto Purēgu Electric Storm Crouches and radiates electricity. Kabuterimon is the partner of Izumi Koushirou. 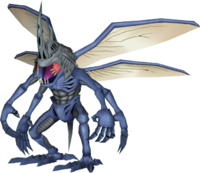 Kabuterimon appears as an obtainable Adult-level Vaccine type Digimon in Digimon World. Several Kabuterimon NPC are found in Beetle Land inside the gymnasium at the left. A Kabuterimon teaches your Digimon the powerful Bug technique only if you have a Defense Stat of 500 or higher and another one joins the city only if you answer its questions correctly, where he'll upgrade the Green Gym's training facilities along with Kuwagamon, by raising more stats when training. Bonus conditions: Have Kunemon as a Partner and have at least 35 different techniques mastered. Kabuterimon's Digivolution item is the Horn Helmet which lets any Child Digimon evolve into Kabuterimon. Kabuterimon's four hands charge black spheres of electricity and tosses them to the enemy. 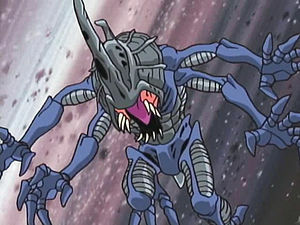 Kabuterimon is an obtainable Digimon. 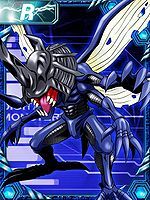 Evolves from Tentomon (0+ DP) and can evolve to Atlur Kabuterimon (Blue) (0+ DP). 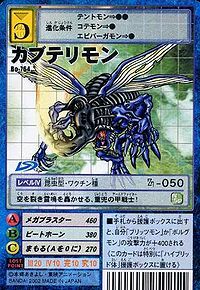 Kabuterimon appears as an opponent and an obtainable Green Card. Evolves from Stingmon, the only Slide Evolution. He is the Adult form of Tentomon. He can evolve to Atlur Kabuterimon (Red). Can be evolved from Tentomon if above level 18 and Defense above 100. He can evolve to Atlur Kabuterimon (Red) if above level 29 and Defense above 150. Evolves from Kunemon or Tentomon. Can evolve to Atlur Kabuterimon (Blue), Anomalocarimon or Jyureimon. Kabuterimon is an obtainable Digimon which is evolved from Kamemon, Pico Devimon, or Tentomon, and can evolve to Atlur Kabuterimon, Lilamon, or Mega Seadramon. It can also be obtained as a collectible card. 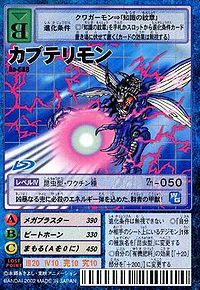 Its card is part of the Tentomon Evolution (テントモン進化 Tentomon Shinka) set. One Demon hacker has a Kabuterimon that you have to fight in Chapter 8. Evolves from Gabumon. Can evolve to Skull Greymon. Evolves from Tentomon. Can evolve to Atlur Kabuterimon (Blue) or be Jogressed with a compatible Digimon to get Jyagamon or Piccolomon. Evolves from Tentomon. Can evolve to Atlur Kabuterimon (Blue) or be Jogressed with a compatible Digimon to get Angewomon or Piccolomon. 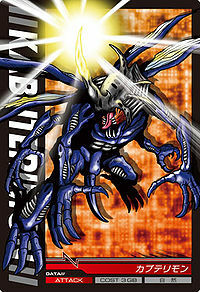 Kabuterimon is a partner Digimon. Evolves from Tentomon and can evolve to Atlur Kabuterimon (Red). Evolves from Tentomon. Can evolve to Atlur Kabuterimon (Red) or Waru Monzaemon. 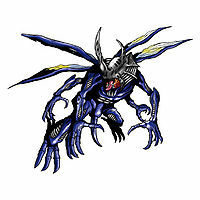 Kabuterimon is an enemy Digimon. It has an iron defense! It attacks with its great horn! It shoots out an intense energy ball! This ultramarine armoured beast charges a deadly energy bullet on its fierce helmet! This heavy-helmeted armed fighter slices through air and lets out a thunderous roar! 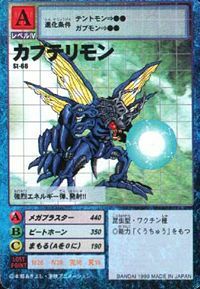 It has great power and a hard shell, both characteristics of Insect Digimon; in particular, its head has been metallized and boasts high defensive power. 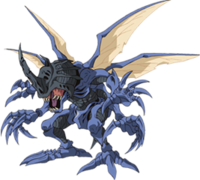 It assaults any Digimon that antagonizes it without mercy. 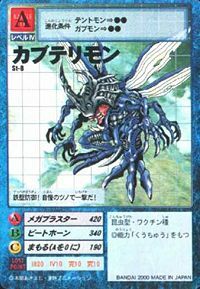 A fairly unique Insect Digimon, even among newly discovered Digimon. ↑ Digimon Adventure: "Lightning! Kabuterimon"
This page was last modified on 10 January 2019, at 19:00.